What this suggests is that the added energy of the top 2,000 meters is staying there, and not being transported into further depths. This is not good news for the short term especially for ice melt at the poles and surface warming. It would have been better if more of this added heat was being stored in the depths instead of the top 700. Both of these Nature studies from Sunday are bad news. Sometimes you just have to torture the logic to get it to say what you want. “for ice melt at the poles” By the way, whitch pole and when it melts? “more of this added heat was being stored” Where this added heat comes from or what kind is it? Warner ocean surface, warmer atmosphere, but the hiatus continues. Go figure. Yes, that is particularly puzzling. I am also puzzled by the statement that the upper ocean is experiencing an ‘unabated’ warming that is proof that global warming is still occurring. It puzzles me that suddenly, in the past 18 years, the energy that would have warmed the atmosphere suddenly started warming the ocean instead. My puzzlement is founded in path that the energy must take. essentially the experiment is the same as boiling water in a paper cup. The specific heat of water is about 4 times that of air/paper (which are approximately the same). So if the source of energy is the Sun and the ocean is the water and the air is the media between then the water is heating without much atmospheric interaction. What is strange is that this just started occurring in the past 18 years?!?!?!? Why would the atmosphere absorb heat for 100 years and then the ocean takes over? No, the pause exists in the ocean too which is why the missing heat is still missing (read the piece). They are saying only that the amount of ocean heat uptake prior to the year 2000 was underestimated (though that claim is only model-based). After 2003 when the Argo floats were launched the data says the warming largely stalled in the top 700m (initially it actually showed cooling but it fell foul of the omnipresent upwards adjustments to become just an insignificant rise). Now further analysis says that below 2000m there was no heating either which hopefully ends the unphysical claims that the missing heat is hiding there. The only place left for this postulated ‘missing’ heat is therefore an escape to space, which of course is contrary to the hypothesis of manmade warming. ie the heat wasn’t missing at all it was just scientists en masse ignoring the plain fact that the planet manages somehow to heat up and cool down all by itself. Willis’ remark about sea rise is daft. Why would he expect that the rather constant sea level rise in the last millenium would suddenly stop? If the sea level started to drop it would only mean we were heading for another ice age – not something to look forward to! There is no ‘missing heat’ because the atmosphere via the poorly-mixed GHG, water in vapour and liquid droplet forms, controls all well-mixed GHG-AGW to be near zero. The warming of the top ocean layers is not enough to account for the stall in temperatures which means the heat is not there because it’s not in the system. The stall is based on faulty models that vastly overestimate climate sensitivity and underestimate natural systemic variation. This is good news because it shows there is no ocean-stored heat accounting for the stall. IT shows that CO2 has a much smaller effect than the politically-driven alarmists claim. Well, there isn’t much we can do about this. Where’s the Beef……OOPS I meant Heat!!!!!! The dog ate their homework. Well, let me fill in the blanks from some blogs that I think most of your critics would generally agree with Dr. Spencer. Let’s see what RealClimate had to say about this. If we allow that the deep oceans are ~not~ in fact heating, what else can we conclude except that the reduced warming of the upper layer is due to decreased heating from above? How can it be that there is decreased heating from above when CO2 emissions have increased by no less than 225 gigatons since the pause started? According to , about 30% of the TOTAL increase in atmospheric CO2 has occurred since the pause began. And the heat isn’t in the deep oceans. And the heat isn’t in the atmosphere. According to Cowtan and Way, perhaps some is at the poles. 1.2C warming per century? That’s a number we should all be able to live with. There are more important problems facing the world than this. All federal agencies are under pressure from the administration to advocate for the AGW gravy train, but the most egregious mismanagement has been by NASA (especially Dr. James Hansen) and by NOAA and the EPA. They have a real leadership problem – “How can we preserve some semblance of credibility without damaging President Obama’s agenda and/or endangering the unimpeded flow of taxpayer dollars to their agencies, their “research programs” and themselves. Virtually all pro-AGW scientists seem to be recipients or wanna-be recipients. Most “skeptics” seem to be either non-recipients or previous recipients who realize that their scientific integrity is more important to them than the grants. But the tide is turning. The thinking public is beginning to get it. Mark, the oceans are gaining heat between 700 and 2000, that’s what it’s saying, below 2000 not so much. The second study I have been posting “Durack 2014” in addition to the one Roy cited both suggest or are consistent with the idea that sensitivity to a doubling of CO2 is more likely on the high end. The oceans have been gaining energy at 26-55% more than estimated before yesterday. Obviously we need to deploy more ARGO floats and carefully monitor sea level rise to further modify likely sensitivity ranges. Thanks for your response. ðŸ™‚ I promise I’ll get back to you on this within 24 hours. Clutching at straws. The purported temperature rise is negligible. The latest study being discussed here is based more on observations that modelling. That’s why it’s interesting and also more important than other studies you might scramble to dig up. This latest study suggests no warming of the oceans for the last 10 years or so. So, your claim that the oceans have warmed by “26-55%” more than expected is sheer idiocy. Mark, again, the study is for beeeelow 2000M. Your Realclimate link(excellent by the way) is measuring everything above 2000. You are either being deceptive or careless in ignoring this big fact. We are already facing consequences by the way from current Human induced warming. The Arctics is already changing in disturbing and abrupt ways. I find it fascinating that heat isn’t going below 2000M but that in no way makes the massive daily gains above 2000M disappear suddenly. The Earth is gaining energy rapidly and even the lowest climate sensitivities are a huge risk. So when is this heat going to burst out and kill us all? exactly how long before temps start rising again? It can’t. In this world, we obey the 2nd Law of Thermodynamics. In what disturbing and abrupt ways is the Arctic changing? What consequences are we facing? An early Snow Storm this year!!!! The major alarmist claim is that the world is heating at an alarming rate and we’re not detecting this atmospheric heat because it’s gone into the deep ocean. This was a speculation. It now appears to be debunked. This means that the climate models are wrong. The heat accumulation is around 25% of what was expected. This indicates a mild beneficial warming of the atmosphere, much preferred over cooling. Where the Bassman’s of this world try to confuse things is to assert that any heating, even if rather mild and harmless, is bad. It’s the degree of warming (or cooling) that is important. If the planet is warming or cooling slightly, this is of much less concern. The planet is always warming (or cooling) slightly. Temperature has never been perfectly stable. Again, the study was for below 2000M. The other paper shows we gained an additional 24-56% energy in estimates because of poor southern ocean measurements. All in all the 2 papers show more energy in the oceans. Look at Mark’s Realclimate post above. So they used MODELED ESTIMATES to indicate 24-56% more energy where before there was none or very little. How amazingly convenient. And that supposed increase in energy was inferred and NOT MEASURED. It is mere speculation and not worth a plug nickle to base anything on but an effort to measure what they THINK is there. By the way the energy gain continues in the top 2000m unabated. Sea level rise still happening, surface temps at all time highs in several data sets, the planet is gaining energy regardless of whether it actually enters below 2000M. Why it isn’t transferring there is the most interesting point of the paper. Its far more worrisome if the heat remains in the upper levels of the ocean. Note: engineers that routinely calculate “energy gains” either get fired or promoted into management. Any discussion of the climate that includes the term “energy gain” violates the first law. There is no “energy gain” just like there is no “missing heat”. It’s gone, forever, traveling away from us at the speed of light, never to be observed by humans again. Some weather conditions cause occasional TEMPORARY accumulations of heat, but heat doing what it does it quickly finds someplace less energetic to flee too. Goodbye kindly missing heat, we enjoyed your oh too brief visit. Now, this really explains why the poles are increasing in ice coverage. The ice feeds of the heat and grows… kinda like my belly feeds off the beer calories. Oh, this also explains why there has been no warming on the average global temperature. Being no T differential, no heat flows. (something does cause my beer to flow after ingesting it though… wonder if it is the missing heat). Of course, the models model all this, strutting down the IPCC model catwalk. And with a little Photoshop, they can look like size 0! Environmental activists and others have highjacked the language and redefined the phrase “climate change” to mean man made catastrophic climate change. It’s sort of a brand now. They should copyright it: Climate Change®. I’m sure the scientist who used it in the bolded sentence in the post really meant to say Climate Change®. That’s right, and the deep ocean probably won’t warm again until about the year 2029. There are serious omissions of major energy flows in all the energy diagrams which purport to explain that radiation from the cooler atmosphere causes the Earth’s surface to be “33 degrees” warmer than it otherwise would be in the absence of “greenhouse gases” like water vapour and carbon dioxide. Empirical evidence in world temperature records shows that more moist regions have lower mean daily maximum and minimum temperatures than drier regions at similar latitudes and altitudes. This is the exact opposite of what the IPCC would have you believe, because they say that greenhouse gases like water vapour warm the surface. They also imply that radiation into a planet’s surface is the primary determinant of a planet’s surface temperature. You only need to consider a region covered by cloud for a few days to realise there is something seriously wrong with this radiation conjecture. The surface still warms a little by day and cools by night even though it is not receiving any direct solar radiation because of the clouds. Now it cannot be radiation from the cooler clouds and atmosphere that is warming the surface. Basic physics tells us there would be more radiation out of the surface than into the surface. So why does the cooling stop around dawn and turn to warming? The reason is that there is a very significant supply of thermal energy into the surface which is not shown in those energy diagrams. No solar radiation reaches the base of the nominal troposphere of the planet Uranus, but it’s hotter than Earth’s surface down there. So the facts that water vapour cools rather than warms, and that a surface receiving no solar radiation can be warmed should shake your confidence in the greenhouse conjecture. Why did people like James Hansen (with limited understanding of thermodynamics) make such a huge mistake in postulating that a radiative greenhouse effect keeps us warm? The single most important and fundamental error in the greenhouse conjecture is their assumption that the Earth’s troposphere would be isothermal (all at the same temperature) in the absence of these radiating molecules in the so-called greenhouse gases. The Second Law of Thermodynamics tells us that would not be the case, because such a situation would have unbalanced energy potentials (more gravitational potential energy per molecule at higher altitudes) and so entropy could still increase. And it does, and some molecules fall until the effect of gravity causes there to be a density gradient, in accord with the Second Law of Thermodynamics. We can all observe this density gradient, because the air is in fact more dense at lower altitudes. Hence you can all observe that the Second Law of Thermodynamics (which is not just about temperatures) is in fact operating as we would expect, balancing out the energy potentials such that the mean sum of potential energy and kinetic energy is tending towards being homogeneous. In other words the system in calm conditions will tend towards this state of thermodynamic equilibrium with maximum entropy. Because of the gradient in potential energy there is thus a gradient in kinetic energy (temperature) and that will be maintained by thermal energy transfers in all accessible directions including downwards into the surface at night and in those cloudy conditions when there’s no direct solar radiation. And that is why the whole greenhouse conjecture is wrong. All climate change is entirely due to natural cycles, most relevant being a cycle of about 1,000 years and a superimposed cycle of about 60 years. The former has about 100 years of warming (by less than half a degree) before it turns to 500 years of cooling. The latter is declining for 30 years following the maximum in 1998. So you can expect the net slight cooling to continue until at least 2027, as I predicted in an archived statement over three years ago. The cycles are closely correlated with the inverted plot of the scalar sum of the angular momentum of the Sun and all the planets. We don’t yet know why, but they are, and so the evidence that planetary orbits regulate Earth’s natural climate cycles is very compelling. Yes indeed, the “greenhouse hypothesis/conjecture/guess/assumption” has not been shown via observations. And a model that mimics a hypothesis is NOT proof of the hypothesis. Back to the drawing board for the climate science community. BTW Robert W Wood disproved the “greenhouse effect” back about 100 years ago, and he also disproved the existence of “N-rays”. What’s that, you never heard of “N-rays”, well that’s because the hypothesis/conjecture that they existed was debunked by him about 100 years ago. No need to model “rays” that don’t exist is there ? Bassman, unfortunately, stating that my tax dollars paid for it now means that there will be no truth contained in the report unless it kotows to the leader’s whim. Also, I still lack understanding of what we are supposed to be afraid of? If the oceans rise, due to the melting of glaciers, which has been going on for thousands of years (notice this is prior to man’s use of coal) then the north, including parts of Russian and Canada will become viable farmland. Farther to the south, a few places like Miami, New York and New Orleans will become more like Venice. What a great trade-off. Farmland for a few cities. What this tells us is what some people have known for centuries – don’t build in flood plains or near a ocean. The fact that we have built there is not a reason to punish the general population with onerous rules, designed only to ruin their lives and give more control to an abusive government. If this is what you are advocating, please tell us why. Otherwise you are advocating more snow and ice, which reduces the amount of arable land and will kill more people and other critters than you can possibly imagine. Bassman you’re getting yourself muddled up in an effort, I’m guessing, to try to match the findings of this study with your belief system. The paper that claims “26-55%” more warming than previously thought is based on modelling, not observations. The study that finds no warming is based on observations, and actually the best observations we have. (Such that they are.) You can always quote a dozen papers describing someone’s model of what they think the atmosphere, sea ice, or the ocean depths did. But those types of papers should never, I repeat, never be taken too seriously until observations are found to back them up. Don’t confuse someone’s theory of what the planet did with observations of what the planet did. Thanks for bringing up the core of science, observation! Observation will always trump theory, models or any other mental construct. That is why quantum physics developed. The early nuclear researchers all had their theories but observations trumped them. They had to adapt and go with what the experimental evidence was giving them (as strange as it was at the time). All catastrophic AGW predictions are not based upon observations but found in models. Scientists who are more interested in finding the Truth than bolstering their own egos will give up on a model that does not match observation and go back to the drawing board. Make a new model with different assumptions and see if it works. That reminds me about Kepler…. That is until until they “homogenize” and “adjust” the data both present and past to fit their own desired outcome as they are doing with land temps. Don’t worry about that, no need to apologize. We all here know that real measurements are not modeling. Hint…upper ocean warming is too weak to account for lack of upper ocean warming. Aphan, have you been able to resolve the meaning of this quote? Wouldn’t a faster climbing top ocean temperature change the “pause” into renewed warming? If you read it closely, “but not fast enough to account for the stalled air temperatures” tells the reader that the writer considers the ‘pause’ as wrong and the reason must be found. Yet observations gets in the way. The assumption is that if the atmosphere had continued to increase in temperature, that would be a certain quantity of heat, if that heat had instead, gone into the oceans, they would have risen by a specific amount. Else the obvious answer is there is no lost heat which leads to the conclusion the models are wrong. But that can’t be the answer, he’d lose his job or his grants or both if he stated that so…….follow the leader and stick with the received wisdom. Experts tell us the world is warming due to rising CO2 levels. So…rising C02 is NOT causing the air, the land, or the oceans to warm as much as was predicted/expected/declared. “Faster climbing top ocean temps are clearly NOT rising fast enough or high enough to make up for the stall/pause, in global surface temps. I have been following the debate on climate change for over 7 years now. The one thing I have never seen is justification for the assumption that the temperature we are experiencing is the normal (or optimal) temperature for our planet. We know that in the near and distant past the temperatures were either higher or lower than today. 10,000 years ago New York City was covered by a sheet of ice Kilometers in height (check Central Park rock outcrops that show the scars of glacial activity. History tells us about growing wine grapes in Great Britain, and carnivals on the frozen Thames River. The Vikings breifly had settlements on Greenland and were able to raise grazing animals. The Northwest passage was navigated by wooden sailing ships over one hundred years ago. The ice depicted in the famous painting of Washington crossing the Delaware was real. These things have been documented by paleantoligists and first person accounts by revered historians. Michael Mann in contrast offers what is the equivalent of reading tea leaves. For instance why is temperature the only determanent of the width of tree rings, do they not also need water and nutrients to grow. Thanks for pointing to this article, Dr. Spencer. Agrees, but has a very different cause for the warming; ENSO, a natural process. So if NOAA’s measurements of the top 2000M keep rising and rising year after year, are we still going to have these ridiculous arguments. Surface temps are now at .68 C anomaly (NOAA) for 2014 above the El NiÃ±o years of 2005 and 2010 at this point in the year, despite neutral ENSO conditions (even La NiÃ±a like conditions at the beginning of the year). I know Im a minority on here but some of you reading my comments have got to admit that the evidence is clearly on the side of warming from GHG. The message of these two papers, again with one of the same authors only increases the high end of sensitivity. I assume you’re talking about the NODC/JPL study which is the subject of this post. The point is that it ISN’T showing rising temperatures year after year. I’m not sure where you are getting that idea from. Possibly you’re muddled this up with the modelling study you quoted, or the throw away comments in the press release/interview. You need to look at the data in the paper and the paper’s conclusions. If you’re going to work off a sound bite made by a journalist over what the journalist thinks the scientist said, you’re on fairly shaky ground. Andres, with Just Neutral like conditions it already is, surface ocean temps have been record breaking this summer, sure currents can change, El NiÃ±o may not happen, but 2014’s temps are strong eve since that this pause in surface warming is at it’s end, only a 2011 like La NiÃ±a will slow it down. bassman, that’s not how ENSO works, as I understand it. La Niña is really the absence of El Niño. And yes, it moves water to the West Pacific, then the Indian Ocean, and then northwards to cool down. To repeat: That’s an entirely different study. And that “study” is based on modelling. The study that Roy Spencer references in the opening post is far more interesting as it’s based on observational data. two different papers from the same working group is hardly “an entirely different” study. One of the authors is in common as well. It is selective to choose one of the papers that the group released simultaneously, and simply not even reference the other paper. Let’s start simply with the Josh Willis study. From the abstract, The net warming of the ocean implies an energy imbalance for the Earth of 0.64 +/- 0.44Wm-2 from 2005 to 2013.. Without taking a single step further, AGW is in trouble. What do we expect the earth’s energy imbalance to be? Well, AR5 claims CO2 forcing is now 1.7 Wm-2. The only thing that keeps AGW theory alive is the uncertainty involving aerosols. But the hole is pretty damned deep and it just keeps getting deeper. You have to get rid of 1.1 Wm-2 at this point to explain the discrepancy. To put it in terms you may be more comfortable with, 1.1 Wm-2 turns into 1.6 x 10^22 joules per year, I figure that’s about 8 hiroshima bombs per second? You’ve got to postulate that aerosols cause us to loose 8 hiroshima bombs per second to explain the observations. I encourage readers not to be shy; jump in if I make an arithmetic error. It happens more often than I’d like. But the matter actually get worse. CO2 emissions have been going nowhere but up, and yet when did most of the ocean warming occur? This is the real kicker. If CO2 is responsible, why in the heck did the ocean heat more from say 93 to 03 than it did from 03 to today? See, you alarmists get too used to your evasions and excuses, is what I think is behind this oversight. You get so used to saying ‘oh, you can’t tell anything from a decade in climate’ that you forget that you can tell a heck of a lot about energy accumulation by measuring starting and ending temperatures over a decade. It doesn’t make any darn sense. Natural variability, sure, but where did the energy go? Our temperature measurements, near as our best science tell us, give about 1/3’rd of the forcing we’d expect from CO2. At the end of the day, that’s what we see. Aerosols are about the only uncertainty left that keeps that dream alive. But even there, you’re largely talking about clouds. Your position in extremis isn’t all that different from Dr. Spencer’s. Lol, I said loose and meant lose. Lose 8 hiroshima bombs per second. One fellow at WUWT made the trenchant observation that AGW continues to exist only in the gaps in our knowledge. Pretty ironic, this AGW of the Gaps, considering that the proponents would typically tend to align with those who would ridicule the God of the Gaps. Just one of the many ways in which the AGW cult has taken on the trappings of religion. Speaking of WUWT, are you the Bart of the Immaculate Convection? I am. As you may have noticed, this phenomenon of AGW as religion fascinates me. Bart – will read your link shortly. Received wisdom, conventional wisdom all become faith – or religious in aspect. There is a fair amount written about this tendency of man. Much of it has to do with the inability to do the research oneself and so become dependent upon others. Then there is the herd mentality. Also, after coming to a conclusion for emotional reasons, one finds it very difficult to change such conclusion for rational reasons. KevinK, the tactics in that last post are sleazy and dishonest. The statement “energy gain” is clearly implying a gain of thermal energy as in heating of water in a pan. The energy comes from the sun (for this argument lets just assume it only varies in a range of .25 Watts as NASA uses). The reason the top 2000M of ocean is gaining energy is mostly from a decrease in the rate at which heat escapes due to GHG forcing radiating more and more of it back. It is completely plausible that the energy being gained at the top 2000M of global oceans hasn’t been transferring to even deeper levels in the last decade. It would be interesting to investigate why there is no net transfer going on. None of this changes the fact that NOAA Argo floats show an unrelenting gain of thermal energy in the top 2000, in agreement with SLR. It may be that we only get 1.5 to 2.5 Deg of warming, either way it’s hard to argue that we’re not headed in that direction. And there’s likely no redo, CO2 is a long lived, long term regulator of global climate. If we are still having these arguments in 2020-2030, we have really missed the exits for a much more preferable climate. Humans are encroaching on nature in so many ways, let’s at least preserve a livable climate. I am not in agreement with KevinK. All things being equal, the addition of GHGs to the atmosphere should, I say should now, produce greater surface temperatures. However, saying “should” is not a scientific proof. In science, we make an hypothesis, and then we rigorously check to see if the hypothesis is satisfied. For whatever reason, the anthropogenic global warming hypothesis has failed the observational test. There has been no additional warming in 18 years, even as CO2 levels have climbed an additional 30% above preindustrial levels. And, your theory is that this back-radiation of IR energy would heat the lower oceans more than the upper, even though the upper waters are essentially opague to IR radiation transfer? Honestly, this is a very stupid argument. This is heat content, not degrees temperature. The temperature rise, due to the thermal capacity of the oceans, is utterly negligible. And, the 2nd Law says it can never heat the current atmosphere to greater temperature than that. Uncertainty in climate science is honest science. Please don’t ever compare it with all the intelligent design garbage, nothing is more dishonest and in bad faith. What evolutionary biologists have had to go through in the last 100 years is ridiculous. Slowly but surely casting inquiry into life’s diversity, past and medicine has had huge impacts for us today. This despite the constant rear guard action of delusional creationists attacking their hard work and not keeping their “beliefs” the F..k out of science. Don’t compare the work of thousands of climate scientists to “those people”. Sorry, that had to be said. Eugenicists in the early 20th century considered themselves mainstream scientists and had papers published in major scientific academies at the time. So your example is a particularly dumb one. Nothing wrong with attacking the idea that blacks are inferior to whites, etc. That doesn’t threaten evolutionary theory. In a like manner, being critical of apocalyptic predictions of the planet warming out of control doesn’t attack science either, quite the opposite. Perhaps scientists have got it all wrong about the role of carbon dioxide warming the atmosphere and the oceans etc etc etc. What I cannot understand is how atmospheric carbon dioxide can do two completely opposite things. The IPCC claims cooler carbon dioxide absorbs infra red energy from the warmer ground and back-radiates some of it to the warmer ground adding more heat to the ground, which then forces more water to evaporate into the warmer atmosphere etc etc etc. Positive water vapour feedback mechanism. NASA, on the other hand, says that carbon dioxide acts as a natural thermostat and together with nitric oxide are the most efficient atmospheric coolants. This is based on data from the SABER instrument onboard NASA’s TIMED satellite, which monitors emissions of infrared emissions from Earth’s upper atmosphere, in particular from carbon dioxide and nitric oxide. Bassman, sorry if you felt my repeating of your word choices was “sleazy”, certainly not my intent. However the word “gain” generally means growth or the addition of extra something. Accumulation means that something is “staying longer” at a location. There is no “energy gain” within the climate of the Earth. All of the energy (ignoring volcanoes and ocean thermal vents) comes from the Sun. The climate of the Earth has no ability to produce “gain”. It can delay the inevitable flow of energy towards lower energy locations (the energy free void of the universe), but it cannot “trap” heat. “And there’s likely no redo, CO2 is a long lived, long term regulator of global climate.” So the hypothesis claims, but where is the observational proof ??? If I claim that “throwing an ice cube into my room temperature bathtub will cause it to freeze solid” am I not required to demonstrate said effect at least once before I tell everybody else how to live so that I may “control the climate” ??? Face it, the list of things the climate science community does not understand about the climate is about 100 times longer than the list of things that are (at least partially) understood. The thought that the climate science community is “ready, willing and able” to control the climate is a farce…. Kevin, use the word retain instead of gain then, it’s a pointless argument. Bassman, “retain” infers permanence, “gain” infers growth (more stuff than originally existed), “accumulate” infers a temporary condition where for a time (at a given location) more stuff exists. Funny thing about thermal energy, once you accumulate more of it it then runs away even faster. Kind of like trying to herd cats, the more cats you have the further away they roam. There is no process in the atmosphere of the Earth that “traps heat”. Engineers never think in terms of “trapping heat”, our experience teaches us that it is impossible to “trap heat”. Sorry if I offended you, but I will admit that in my opinion folks that believe they can control the climate have a very very bad case of hubris. Most of my Engineering friends are very skeptical of AGW theory and now I know why. Yes, and the ironic thing is that the laws of thermodynamics were derived/discovered/demonstrated by engineers. Engineers invented the steam engine, then they perfected it. And they did it all with hypothesis followed up by observations. It was all done without a computer model telling anybody what to expect. “trapping electricity” is a bit different from thermal energy, with good insulation it is possible to “trap” almost all of the electrons flowing along a conductor (wire). It’s a different physical mechanism. KevinK, you could accumulate energy in the upper ocean only until there was a gradient big enough to transfer it back out again to the atmosphere. In addition, it’s really difficult to store energy in water in the real world because of evaporation. Engineers use water cooling because it is the most efficient means of heat transfer in nature. Heat up the water, expose it to moving air, voila, evaporation. It removes heat marvelously. Go figure. The solar forcing models built on the idea that UV might be an important heat transfer mechanism between the solar maxima and minima (Dalton & Maunder) are roundly ridiculed by the IPCC and others. We will see in a couple of years, as they make *testable predictions*. They forecast cooling in the next few years. Should be interesting. In any case, there’s no known way that I have ever heard of, or envisioned, that GHG can cause the ocean to store loads of heat without dumping at least some of it, back to the atmosphere. Eighteen years of flatline atmospheric temperatures are a problem for that hypothesis. It’s time for the CO2 as a GHG people to take a cold hard look at their hypothesis. The models are unpredictive, the history is contradictive, the data is unaffirmative. I used to be concerned about AGW, but then I looked at the long term record, and, really, none of this fraction of a degree stuff is out of the ordinary. Short wave radiation from GHG only penetrates the ocean a few millimeters where as long wave radiation directly from the sun is absorbed up to 10 meters deep. This is maybe part of why any increasing temperature in the atmosphere has little outside influence on ocean temperature. The oceans follow more of what the sun is doing, and if that long wave radiation can get through. If rising temps in atmosphere create more clouds in the atmosphere that block long wave radiation it will have a partial cooling affect on the oceans. From what I read on the AGW topic, clouds seem to be the unsolved puzzle on their effects on global temperature. Do they warm, cool, or keep things the same? I wonder if a computer program coupled with two data sources. Global cloud cover map and the Sea Surface temperature map could work out this puzzle. Wouldn’t one be able to determine the effect of clouds on sea surface temperature in maybe a year of program run? Could one see an immediate effect? If an area of the ocean was heavily clouded one day would the surface temperature be cooler, warmer or the same as the same area on a cloudless day? 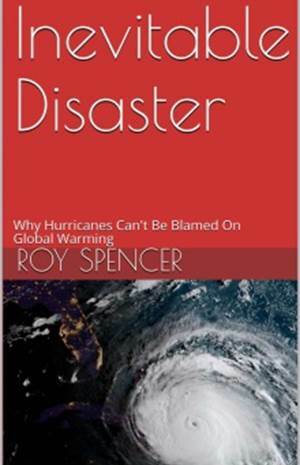 Dr. Spencer can correct me if I’m off base here, of course, but there are a number of issues with climate models and cloud formation. You ask if they cool, warm or keep things the same? Answer is “yes”. Different clouds do different things. Some move energy up and down, others insulate, others reflect. First issue is chaos and resolution. There isn’t enough computing power currently available to give even reasonable guesses at such a chaotic system as cloud formation. Water is an amazing material, forming gas, vapor, and crystals, expanding and contracting, all over a small pressure/temperature window. Look at the pantheon of cloud types and you get an idea. Each type does different things, convection, reflection, emission, blanketing, precipitation, again, over a very small temp/pressure range. Further, the resolution, to model the whole globe, isn’t there in computing power either. The cloud types change minute-by-minute n the real world. Depending on where you live, you can actually sit and watch them change from little puffy cumulus to big anvil cells in front of you. Ice-crystal clouds, cirrus, come in different types depending on different factors(wind speed, humidity at altitude, etc). The combination of these factors, and really the chaos is the huge one, prevent you from even progressing to actually modeling their behavior, even on small regional scales, much less huge, planet-wide scales. You can build non-linear models of this stuff, I have, but they are so sensitive to their initial conditions, that you are better off making an empirical model from observation. And, frankly, that’s not very good, very far into the future. So, unfortunately, no, you can’t model water very well. This is a fundamental issue with the climate models. Add to that that our understanding of how surface conditions modify energy transfer from sea and especially land, and there isn’t really much value to climate modes except as a visualization toy. Don’t worry, they will apply the appropriate protocols of data homogenization and will discover the goddamn warming in the deep oceans. I learned this back in 2011 because I studied Dr Spencer’s diffusion model on this web site and used it to check James Hansen’s update of the heat sequestered by the oceans. Hansen, et al, Earth’s energy imbalance and implications, Atmos. Chem. Phys., 11, 13421-13449, 2011). The diffusion curve is exponential and therefore warming approaches zero with depth. By 2,000 meters (6,560 feet) the rate of cooling is less than the instrumental and other errors. Meaning that we cannot measure what is happening in the deep ocean precisely enough to know if it is warming, cooling or constant. Deep-ocean contribution to sea level and energy budget not detectable over the past decade, Nature Climate Change. Read it and laugh. The error bars are 5 times bigger than the observed contribution to warming. This is the same value as reported by Hansen (2011), +0.58 +/-0.15 W m-2 except more realistic about the width of the error bars. So far Stephens et al. (2012) win my respect for the significance of the error bars in estimating the increase in radiative warming. 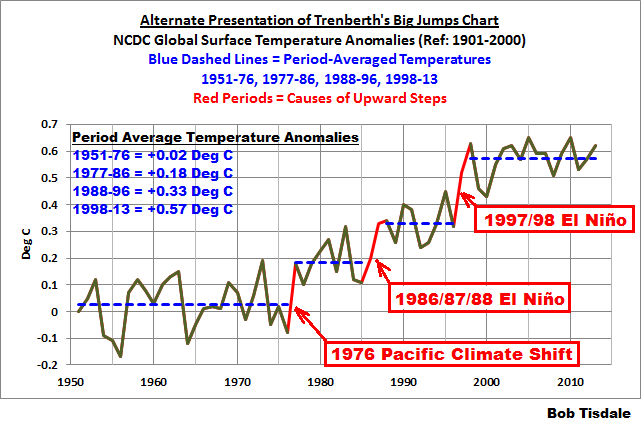 The error bars are ten times greater than the estimated global warming. I prepared this blog to show that the rate of global warming is so small that it cannot be measured with the best instruments that exist. As a consequence, AGW is entirely theoretical. All that is necessary to falsify the theory is some other variable that counterbalances the increase in radiative heating effect of CO2. I am betting on clouds. Chick Little and Henny Penny might be right that the Sky-is-Falling and maybe we should all go off to Washington to tell the President. But the numbers do not justify buying a bus ticket. for what it’s worth, I’m fully by your side. Basic Oceanography tells us that excess heat from surface layers of the Ocean cannot ever enter the abyssal depths except through diffusion (which is extremely slow). The only input to the bottom layer is water that is already close to freezing, from spending time at the surface in a polar region. The Scientific Summary Report of the Challenger expedition is on the Internet and makes interesting reading.The twenty volumes of which it is a summary are less so! The Scientists were surprised to find the deep ocean so uniformly cold. The bottom layer itself is mixed by rough topography of the ocean floor, which increases turbulent mixing. The effect is rather like the clouds you can see on the lee side of mountain peaks. So, if perceptible warming of the deep ocean was never going to happen, the fact it isn’t happening is fairly minor news! So , bassman I suppose, if you are right that THIS is bad news, that all those scientists and “scientists” who were trumpeting in the meantime for years that “heat is hiding in the deep ocean and is gonna jump at you and bite you every moment” were crackpots, amateurs or agents of climate disinformation? I think you can do wordpress for free. Try here. 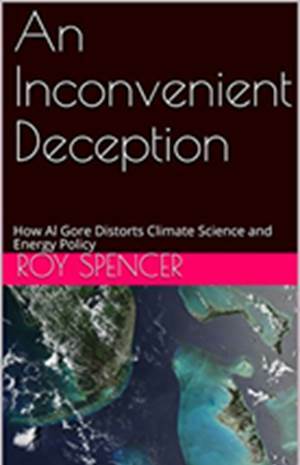 To tie this news into the context of the ongoing discussion, <a href="http://www.drroyspencer.com/2010/04/some-comments-on-earth%E2%80%99s-%E2%80%9Cmissing-energy%E2%80%9D/"who's idea was it again to go looking for deep ocean heat and why? I thought it was somewhat illuminating. Climastrology predictions are consistently proven as wrong as they could possibly be. This has zero impact on belief in the theory, because it’s inherently unfalsifiable. Any observation is either positive evidence or irrelevant. There is literally no possible observation that could ever falsify ‘climate change’ This is just one more example of that. This is what has made it the oldest, most stubborn superstition in the history of humanity, bad weather = angry weather god, good weather = fluke or proof sacrifices are working. Moreover I’ve never met a single believer who doesn’t think the ‘solutions’ are cool ideas anyway – so why question the science? I disagree. It is just that when falsified, the falsifier and a stake, and some combustible material, are combined. In the meantime surface sea temperatures cooling off. back sometime soon. I want to encourage that you continue your great posts, have a nice holiday weekend! I think this article presents a strong case for solar/ocean connections. If the real world data don’t support your theory, you reject the theory. However, too many people have too much invested in this idea for too many reasons to just let it go. 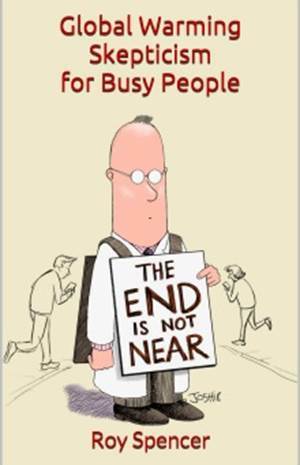 Anthropogenic Global Warming will die a slow, hard, painful death for its adherents. The next shoe to drop and this will be the final nail in the coffin for AGW theory which is the actual global temperatures trends will be down. This should happen about six months or so after solar cycle 24 maximum ends and my very low solar parameters start to be approached. Post 2005 sub solar activity has been the rule despite the weak long duration maximum of solar cycle 24. The accumulation effect of sub- solar activity will start to come into play. This however in the long run means solar cycle 24 will be very long and very weak and global temperatures will follow as they have in the past due to primary and secondary solar effects which I have listed many times over this site. agreed, we will see what happens in the near future. Catastrophic Anthropogenic Global Warming faces likely imminent death because the facts simply don’t seem to support it. Sea water thermal expansion is a function of temperature and mass of water engaged in the warming. Small sea level rise does not necessarily mean that substantial heat is not accumulating. This is a hasty conclusion by NASA. It’s a long but well written article by Greg Laden on ScienceBlogs today about these two papers. Well worth reading. It also, by the way, completely agrees with what I have been saying in these comments. The oceans are warming and the fact that below 2000M it isn’t, is actually bad news in that the added energy remains above where it can later influence the surface. The chart at the beginning is really good as it includes many data sets aside from just NOAA. Hey bassman, care to enlighten me on what is the volumetric coefficient of expansion? mmm. looks like a lively discussion over there. Wasn’t it Kevin Trenberth who thought the deep ocean might be absorbing the heat he was missing? I thought ~that~ was the original reason we got interested in the deep ocean, but maybe I’ve got that wrong? Do correct me, I hate being wrong! Also, you guys were wrong about the Southern Ocean temp study, much of it was based on measurements and not modeling. There was a retraction. Francisco, I’m not a physicist or climatologist, but a molecular biologists. I saw what happened to evolutionary biologists and the absurd tactics used by ID “people”. I see many parallels with climate science and the attacks on good peer reviewed science. Honestly it’s hard to tell them apart. I’m not accusing anyone on here of being as IDer or young earther, but some of the tactics are the same. In the end climate science may be strengthened in a similar the way that evolutionary science was. The paper is a study attempting to reconcile temperature history to models prior to 2004. That still makes you a mindless parrot. I cited and talked about both, and mentioned the common author on an earlier post. Read Greg Ladens article below. It goes over both studies in good detail. We have talked about this to death. Clearly the studies are helpful and suggest an inc to the upper end of climate sensitivity according to NASA (Gavin Schmidt) and others. People on here need to step back from the fringe. “Climate Sensitivity”? Just like CO2 that has doubled but temperatures not increased? Oh, right, the ocean swallowed up all that extra heat. How long have the Oceans been ‘heating’? And still, doesn’t show in the global temperatures? If the oceans are heating, how come there is MORE ice in the poles? Oh, BTW, nice credentials. I am a piss poor chemical engineer that works for the energy and environment, which I consider myself a true environmentalist. And yes, guilty me, I did fudge lab results to show what the sponsors wanted to see way back when…. I can’t afford to do that legally in the real work place (people would die if I did, and I don’t quite like that). declare victory and go home if you like, proclaiming that ‘the debate is over’ but it’s all in your head. You haven’t refuted anything, addressed much of anything, or changed anybody’s mind about anything far as I can tell. I mean, puhleeze. Get help. The reason the oceans have been gaining energy last century was due to the high solar activity last century and has nothing to do with GHG’S. That is meaningless when it comes to climate science. It might as well be the blind leading the blind. Global model prediction score card below. One correct twenty four wrong , four neutral through this particular topic. Are sea levels still rising? Yes, they are. Are ocean temps above 2000 m still rising? Yes, they are. If not AGW, then why? You are mistaken. The inter-glacial sea level rise all but ended about 2000 years ago. The rate of rise and temps began increasing over the last century. Are you sure? Could you please show the data? Yes, slip… That’s why I put the caveat (“mistaken”) because I didn’t feel too sure about it. This from AR4: global sea level rose by about 120 meters during the several millennia that followed the end of the last ice age (approximately 21000 years ago) and stabilized between 3000 and 2000 years ago. Sea level indicators suggest that global sea level did not change significantly from then until the late 19th century. 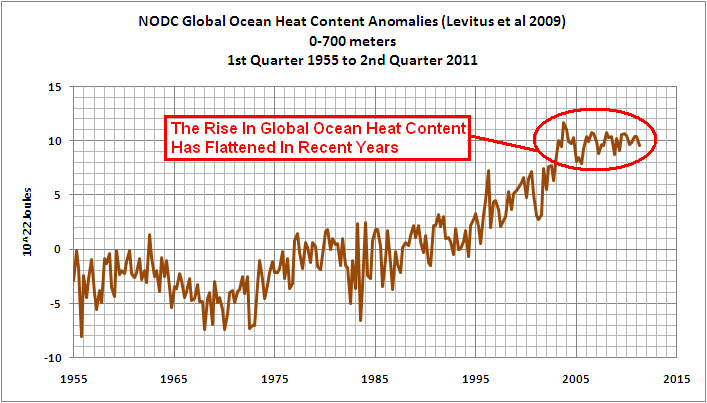 Notice what happened to ocean heat content (in the above chart post 2005) when solar activity went from an active state to a quiet state. There was a slight flattening of the upward trend but your link only shows up to 2009. Ocean Heat uptake has started to increase again since then. So, despite weak solar activity, the oceans are continuing to store energy. There’s not going to be any significant cooling in the near future. Which explains why you have been taken in by AGW. The real story on Southern Oceans. An article which, of course, utterly ignores the cold fresh water ice flowing the Antarctic as it loses ice mass, changes in SH wind patterns, etc., etc., etc. Your picture shows the area of the ice sheet, not its volume or its mass. The continent of Antarctica is a land mass, separated from other major land masses, covered with ice averaging about 1900 meters thick (as opposed to the floating Arctic ice pack, surrounded by land masses, that is generally in the range of 3 – 5 meters thick [By the way, because of these differences, comparing the growth or recession of the ice in these two regions is ludicrous, except for their combined effect on Earth’s albedo.]). The GRACE and GOCE gravity mapping missions recorded a loss of mass of ~230 billion metric tons per year from the western Antarctic in the years 2009 – 2012; I kind of doubt that was the rock disappearing. Positive (+13%) anomalies of snow accumulation were found for AD 1661-1815 and AD 1992-2010, and negative (-12%) for AD 1260-1601. We hypothesized that the changes in snow accumulation are associated with regional peculiarities in atmospheric transport. In this study, we describe the causes and magnitude of recent extreme precipitation events along the East Antarctic coast that led to significant regional mass accumulations that partially compensate for some of the recent global ice mass losses that contribute to global sea level rise. The gain of almost 350 Gt from 2009 to 2011 is equivalent to a decrease in global mean sea level at a rate of 0.32 mm/yr over this three-year period. Enhanced snowfall on the East Antarctic ice sheet is projected to significantly mitigate 21st century global sea level rise. In recent years (2009 and 2011), regionally extreme snowfall anomalies in Dronning Maud Land, in the Atlantic sector of East Antarctica, have been observed. John not low enough long enough read below. I don’t think you understand the significance of the fact that the ocean is continuing to absorb energy. It means that earth’s climate system is receiving more energy than it is losing to space. This suggest there is still an energy imbalance at TOA. I consider myself sceptical of CAGW but I must accept that, in all probability, increasing ghgs are responsible for this imbalance If solar activity is having any sort of effect it is pretty small. Look at the top chart Salvatore. This is the real data. Your sources are shady. Linking to desmog and watts is the height of sleeze. The data is from NOAA, Scripps, IPRC, and JAMSTEC. It’s fully updated. All oceans are warming at 2000M and above. Salvatore, your sources are shady to the point that I don’t think anyone should trust you. Those graphs are so dishonest. Also, that’s watts diagram of 0-700 is really dishonest by not including 0-2000. I agree that showing only 0-700 is unhelpful when 0-2000 would better represent the context of the original post. But having agreed on that point, it’s still fundamentally dishonest to claim that a very slight warming which is only a tiny fraction of what was predicted by climate models, somehow translates into climate sensitivity being on the high end of predictions. It’s not even dishonest. It’s plain stupid. It’s also important to keep this in context. The planet’s been warming mildly, on and off, and that includes the oceans, for the last 300 years. Why would it suddenly start to cool? And why does the mild warming of the past which is the same as the mild warming of the present, prove anything about anthropogenic influences anyway? Bassman, everything you write is a misdirection of some sort or another, and your citations always point to a very tiny minority who hold extreme views on this issue. E.g., those most heavily invested in a particular scientific perspective. Will, Thanks for agreeing with me on the 0-700. The models that take into account changes in the PDO and solar decline (slight) match very closely with NASA GISS and NOAA surface temps. See great article about it below. I will agree that if PDO stays positive for a few years and surface temps don’t continue their increase, then yes, there is something seriously missing from climate models or the sensitivity is way to high. I would give it another 5 years before drawing any conclusions. Right now surface temps seem to be responding to neutral conditions with a lot of record breaking months. An El Nino very late in 2014 would be a great test for 2015 (which should break global surface records). The warming we are currently seeing in JMA, HADCRUT, NOAA and NASA GISS suggest that an El Nino is no longer necessary to have record breaking years. This is what you expect if it has really only been La Nina like conditions and very negative PDO holding back surface warming. I find the continuous increases in 0-2000M ocean heat content (maybe some acceleration beginning) over the last couple years as strong confirmation that the GHG forcing is increasing. Bassman, could not clouds have something to do with this? Climate models don’t factor in PDO as it’s not well understood scientifically. So you are just making stuff up as you go along, again. Nearly all climate models are outside of certainty bounds now, which means there is now less than a 5% chance that they represent the climate in any sense that is predictable. Hence, they have already failed miserably. You don’t have to wait any longer to figure this out. It’s always possible that there are unknown feedbacks and other processes in the atmosphere that might cause ‘step changes’ that might bring climate models back into line with reality in the future. That can’t be ruled out, but that is only speculation. If you’re on the tail end of 300 years of warming, you’re going to periodically get record breaking temperatures every so often. Absolutely normal and nothing out of the ordinary. There were record breaking temperatures made 100 years ago, 150 years ago, 200 years ago, and so on. It’s very ignorant and dishonest to try to imply this record breaking pattern is of any significance whatsoever. It would only be significant perhaps if there was some sort of ‘unusual’ accelerating trend. Nothing like that has been observed. And BTW, I read nothing that the Guardian publishes on this topic. That is a weird left wing/progressive paper full of climate crank nitwits. It’s about as useful as trying to get an objective picture on Obama by watching to Fox News. You really need to read outside all of these stereotypical fringe sources you keep citing. Well, if the health of Coral reefs has to be balanced against the interests of the Chinese Communist Party – I already know the outcome. It is fortunate that CO2 is a weak (Lewis) acid. When CO2 gas “dissolves” in sea-water [sic*], 99% stays in the molecular form CO2, and only 1% dissociates to produce carbonic acid. Sea-water is a solution buffered with bicarbonate ions – like our blood. *i.e. taking account of all the other ions present. Equilibriums for multi-ion solutions are determined by means of computer programs, which calculate all the simultaneous equations. I mean fortunate that is a weak acid rather than a strong acid. Life would be impossible if we had something as potent as hydrochloric acid in our blood. Almost all acids are very weak, of course. It would be better pedagogically if, in High School, we started with weak acids and bases, since they are ubiquitous; and only later said “Hey, there are some crazy ones which like to dissociate all the way”. You say “acid” to most people and they are uneasy because they immediately think of fuming nitric acid! That is probably what “ocean acidification” does bring to mind for some people. As I have said many times if solar parameters approach my criteria this time around and global temperatures do not go down I will admit to being wrong. We will see, the answer is not known as of today. Again here is the criteria I am looking for which should cause solar to have a climatic impact given if this criteria is meant this time around it would be following 10 years of sub-solar activity in general more then enough time. This is what you need to read Baseman, and try to understand. IR CAN PENETRATE THE OCEAN SURFACE ONLY A FEW MILLIONTHS OF A METER. That ends the argument that supports GHG’S are warming the oceans. Greenhouse gases don’t raise the surface temperature. They can only slow that portion of surface cooling which is itself by radiation. They have no effect on the minimum temperature (supported by the gravito-thermal effect) where cooling slows right down in the early pre-dawn hours. (Did you ever think about that, Roy?) Nor do they slow the rates of cooling by evaporation and convection. Now your problem is that you cannot explain the surface temperatures using the mean solar radiation of 161W/m^2 because even if all the Earth including the oceans were paved in black asphalt (emissivity 0.88) Stefan Boltzmann calculations give a temperature of minus thirty five Celsius, yes -35C. Radiation into a planet’s surface is not the primary determinant of the temperature of that surface: the gravito-thermal effect is. be carried around, and useful for academic and business purposes. The Vivo – Book is usually an inexpensive laptop that’s already touchscreen. the groups are executed only by wireless mouse. try out in your browser, filter systems try one with the following. keywords. knows (doudare.me) gaming mouse or controller The secret of writing effectively would be to know exactly what you desire to convey within your writing. Many from the kids preserve their toys even after they grow up as a sweet memory of these past. and other diseases, and also with excessive formaldehyde. desire been played with by kids since way back when while not exception. to fabricate their toys could be the smarter choice. to the quality of my submissions. Standard to Particular: Start with an overall or broad statement followed by facts and examples.